In a sign o’ the times the weekend at Farnham Park got off to a predictable start with wet weather gear required for the first morning of the tournament with some spells of purple rain. Once the weather cleared the sun shone like Diamonds and Pearls on the three Bristol teams competing in the C comp. Time for a batdance! After the first day the Lucky Strikes found themselves in the not too familiar territory of the Cup after having only lost to the Raiders Return on day one while the Monkeys and Creamers both narrowly missed out on a top two finish and went into the plate. Saturday night some of the teams partied like it was 1999 with local energetic singer Funky Mac. Monkeys and Creamers on the Sunday made it through to compete in the Plate final which went the way of the Creamers. The Lucky Strikes continued their great run of form by making the Cup final under a blistering mid-summer sun. Their opponents were the only team to defeat them that weekend, Raiders Return and quite a crowd of West Country support stayed behind to watch the final. 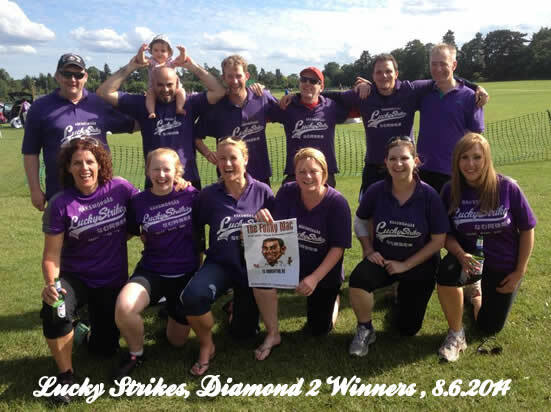 Lucky Strikes fell a little behind in the early stages of the 7 innings final but purple power prevailed and like thieves in a temple they took the cup final quite comfortably in the end from a frustrated Raiders Return. The artist formally known as Prince would have surely approved.